A Check_MK plugin which is supplied as part of the standard install but not 'turned on' is the 'smart' agent. It is a plugin which resides on the target with hard-drives to be monitored. Temperatures and other useful statistics can be collected. The plugin can be found in the share/check_mk/agents/plugins/ directory amongst a number of other useful plugins. It needs to be copied to the /usr/lib/check_mk_agent/plugins/ directory on the target to be monitored. In order to be useful, the 'smartmontools' package needs to be installed as a pre-requisite. Values are charted as well. 'modprobe coretemp' can be used to obtain instant gratification by loading the module interactively, instead of at the next reboot. Check_MK plugin: lmsensors: a place to which I need to return and try installing his plugin for more information display in Check_MK. Earlier Article I wrote doing something similar but different. I use an app called 'psensor' for watching system temperatures in a chart form. OMD is a collection of monitoring tools which include the Check_MK monitoring application. Check_MK is a series of Python scripts and agents designed to simplify the use of a Nagios based scanning engine. I have a BTRFS filesystem mounted on /var/lib/lxc. the -B btrfs creates a BTRFS subvolume for the container, which allows snapshots and the like. I am using Open vSwitch to provide bridging capabilities to the container and its environs. This particular container, using the lxc.start.auto value, will auto-start when the host restarts. During the 'omd create site01' step, I select the Nagios 3 engine, and set the Check_MK interface as default. The next experiment is to install the Raw Version and see how that differs. Nagios has been wrapped by check_mk (a python based pre-processor), which in turn, has been wrapped by OMD (Open Monitoring Distribution) to provide charting capabilities. The OMD web site installs an older version. This documentation shows how to install a slighter more recent testing version. An over view of plugins available in check_mk: Catalog of check plugins. Note: Use 'make deb' or 'make rpm' instead of 'make pack && make setup' to build real system packages. I also note that the git repository has only v1.2.6p12 included at the time of this writing (changelog on Oct 1/2015), when on check_mk download page, they have v1.2.6p16, 1.2.8p15 available with the RAW edition. The RAW edition might be superceding the OMD edition and might be the way to go in the future. I will need to try that through the above instructions during my next iteration. Some organizations will run an internal network monitoring solution to detect significant network outages. This solution typically uses a cellular modem as a sort of out-of-band (OOB) alerting mechanism. Rather than using that method for a particular requirement I had, I developed a bash script called path-loss on github which can be run in a VPS external to the network. In fact, I run one copy in an Amazon instance, and another copy in a Google instance. The scripts can thus check each other as well as the external network nodes under test. Each node has a series of pings sent to it. If there is a loss of pings greater than some count, as defined in a script variable, then an mtr based traceroute will be generated for that node. If any nodes show a loss of pings and have had an mtr generated during a measurement interval (based upon a crontab entry), then a log of all nodes and their results will be sent to a Slack channel of choice. A Slack bot token-id and channel name need to be supplied in script variables. When all pings have returned to normal, another report to Slack is generated. A 'member' indicator is used with select nodes, such that if all members are unreachable, then a PagerDuty alert is generated. There should be at least one non-member node. This allows another test: if all nodes (members and non-members) are unreachable, that typically means that there is a local network issue, so the event is logged to syslog and no Slack or PagerDuty events are generated. Flings: Apps and tools built by VMware engineers that are intended to be played with and explored. One fling, called I/O Analyzer, is a virtual appliance designed to run workloads to help baseline performance capabilities of a system. Another one, called OS Optimization Tool can enable or disable services in a Windows system image template. Some services may not be necessary, if and not running, will reduce the load on the host. 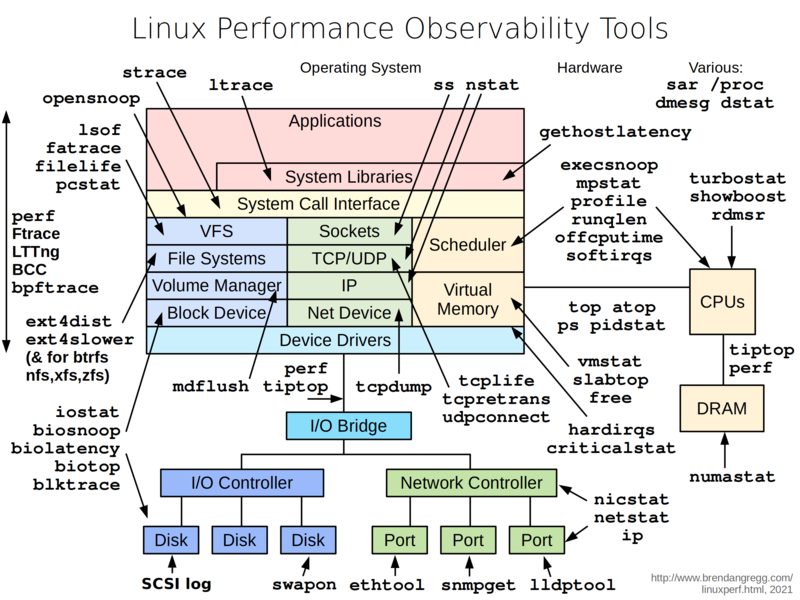 Brendan Gregg (Netflix) designed a chart called Linux Performance Observability Tools. There is a slide show on that page describing tools for the various modules of a Linux system. Look for the Linux Performance Tools slide show. There are others interesting slide shows as well. VMware esxtop: similar to Linux top, but more expressive as it shows many performance indicators for a VMware host. and look for the "insns per cycle" line. ticketmaster's metrilyx: web based dashboard engine allows for analyzing, cross cutting and viewing of time series data in a simple manner. To monitor browsing habits of company users, and to use the information for possible site blocking or traffic limiting with MasterShaper, URLSnarf along with a Perl script can be used to log specific items to a database and place the full capture results into a log file. The log file will be rotated with logrotate. RANCID provides two types of functions. One of its foundations is that it provides a structure for logging into network devices for the purpose of obtaining configuration files. The second is that it stores versions of the configuration files in CVS. CVSWeb is a web based tool for reviewing and comparing the files under CVS version control.